In Russia, a labor crew is blowing stuff up for a new road when they discover a crypt. Worried that someone will loot the newfound treasures, they post a guard. Sadly, the guard is someone dumb enough to pull a wooden stake out of a dog he finds inside a coffin. 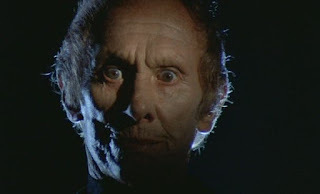 Zoltan, the hound of Dracula, rises, bites the guy's neck and resurrects Dracula’s servant, Igor. The two head off to the U.S.A. to track down Dracula’s descendant with the goal of turning him into a vampire and bringing the bloodline back to unlife. Igor finds out that Zoltan left him a little surprise in his coffin. For such a silly concept, Dracula’s Dog tries to deliver on some of its promise. The combination of Zoltan’s lean almost skeletal body, the unusual lighting of his eyes, and his performance on screen go a long way to selling him as an actual threat to the other characters. When everything is working, he’s a silent, seemingly intelligent monster. However, whether it was matter of budget or time, there isn’t much for him to do. He skulks around biting the occasional person, and raises an army of three whole other vampire dogs. It feels underwhelming. Zoltan’s target is one, Michael Drake (Michael Pataki), a boring psychiatrist with a boring family who go out on a boring camping trip. If we were not told he was a descendant of Dracula, then there would be nothing remarkable or engaging about him. This also brings up a plot hole: Zoltan needs to bite Drake in hopes of bringing the vampiric bloodline of Dracula back from the grave. His children, technically also descendants of Dracula, seem like they are much easier targets, but Zoltan never bothers with them. So either, they aren’t blood related to Drake (which is never brought up), or Zoltan is just a dumb dog. "Ooh, here come's Dracula's Mailman!" Aside from a little blood sucking, Dracula’s Dog has little to offer in the special effects department. 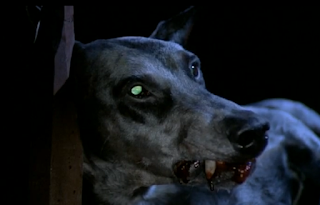 Kudos to the film for going so far as having Zoltan bite a puppy, but the end payoff is either the least scary idea ever put on film, or Dracula’s Dog finally acknowledging the goofiness of its entire concept. It may tip its hand a little earlier when we learn Zoltan’s origin, in which he is vindictively bitten by Dracula after foiling one of his kills. The image of a tiny adorable vampire bat biting a dog is hardly the kind of thing that instills fear in an audience. Could Dracula’s Dog actually have worked as a film? I suppose if the creative team had chosen to either embrace the inherent comedy or really pushed the horror of pets turned killers, it might have been at least interesting. What we are given though, is too middle of the road to inspire much beyond mild curiosity. Dracula’s Dog has very little bark or bite.